Re-energized by the joyous celebration of our 2nd Anniversary and the constructive 2nd Annual Partner Meeting on 25 June, we look forward to a full and varied program this July. Activities range from a panel discussion on street food in Bangkok and the discussion of a recent book on Burma, to a photo exhibition on Khlong Toey, the screening of a short documentary on social protection and health insurance in Thailand, and the world premier of an innovative Indonesian movie addressing the challenges of pluralism and equity in modern day societies. We hope our programs continue to interest you and we look forward to continued interaction and support. SEA Junction will launch a new series on street food and its many dimensions in Southeast Asia entitled “Beyond Food”. 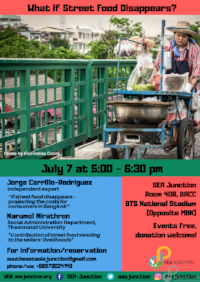 This first event will discuss the implications of an eventual disappearance of street food in Bangkok mainly from an economic perspective for both the sellers and the consumers. 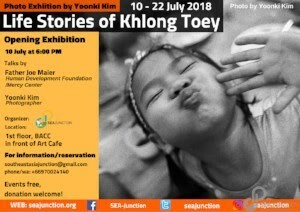 The photo exhibition organized by SEA Junction in the first floor of BACC showcases the life stories of six residents of Khlong Toey as chronicled by Kim Yoonki over a period of 12 years. 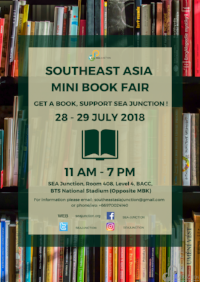 The exhibition will be opened at SEA Junction with a talk by Father Joe Maier, one of the founder of the Human Development Foundation/Mercy Center in Khlong Toey and by the photographer Yoonki Kim. From behind the walls of Burma’s prison to the 1988 uprising and to border towns and communities of displaced ethnic groups. What does Burma’s past tell us about its future in its bumpy road of political transition? 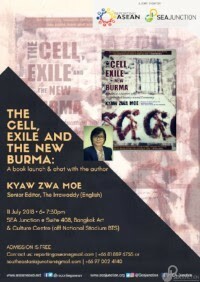 Reporting ASEAN in collaboration with SEA Junction will reflect on the above issues with a discussion of the recently published book “The Cell, Exile and the New Burma” The journalist Johanna Son will interview the author Kyaw Zwa Moe on the book contents and related topic before facilitating the public discussion. 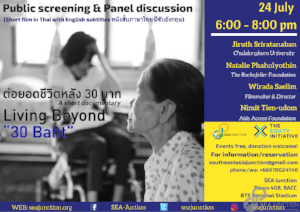 The short documentary ต่อยอดชีวิตหลัง 30 บาท or Living Beyond “30 Baht” (in Thai with English subtitles) discloses the struggle and resilience of Thais who cope with illness, aging and disability with the support from the 30 Baht insurance and other schemes. Produced by a team composed by Jiruth Sriratanaban, Natalie Phaholyothin and Wirada Saelim with grant funding from the Equity Initiative the documentary and the related panel is meant to stimulate public discussion of UHC that goes beyond technocratic considerations and is informed by the experiences of those who most need it. “Lima” (“Five”) is an innovative Indonesian film that has been released on 31 May 2018 to reflect on Pancasila (national ideology) Day. 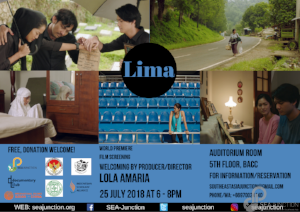 Differently from other films on the same topic, Lima refrains from being propagandistic and instead probes the depth of the five principles of Pancasila, questioning what it really means to be a tolerant, pluralist, just, consultative and inclusive society. The producer and director, Lola Amaria will attend the screening of the movie, which is being shown at the BACC Auditorium for the first time outside of Indonesia before touring to Europe.